Kunal did send us (a while ago, but that’s another story) a new MFL Records aka Moscow Funeral League release, this time being a split in between two great Doom acts from Russia and Finland, gathered as The Symmetry Of Grief. Doom on! Who Dies In Siberian Slush were formed more than ten years ago, initially meant to be a solo-outfit of vocalist (and guitar player) E.S. (and if I’m not mistaken, he’s the guy behind this label too). 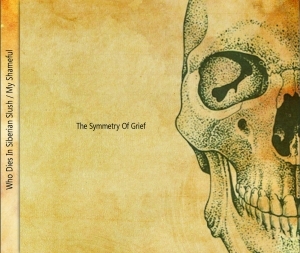 In mean time, several musicians joined, and after some demos, two full lengths and a split with Ukrainian solo-project Ego Depths, the band took part on the split The Symmetry Of Grief. Both songs were recorded at the Primordial Studio, and everything was mixed and mastered by My Shameful’s Sami. First track is The Tomb Of Kustodiev, clocking almost ten minutes (the other piece also clocks ten minutes), bringing utterly slow and highly melodious Doom Metal in the old schooled tradition, with inclusion of flutes and trombone, and including a somewhat funereal approach. E.S.’ vocals are extremely deep and grim, and on the background, once in a while, there are some blackened screams too. But let’s come back to both unusual instruments (though flutes aren’t that uncommon within the Metal scene, actually). But anyway, the trombone parts are quite important, being one of the prominent instruments for sure (along with, evidently, the melodic twin guitars, for example). And the flute-parts are rather rhythm instruments (cf. the rhythm guitars and basses), yet they do add quite a goth-folk-alike aspect. Pretty much the same goes for And It Will Pass, also being based at the first place on melodic and little emotive tremolo leads, heavily being supported by a vast rhythm section, floating flutes and the classic twin guitar tandem. After about two minutes, this track also introduces a piano excerpt, before welcoming the trombone once again. Here too it gives the whole a very strange and uncomfortable yet, at the same time, dramatic and cinematic feeling (and I do not think it would be impolite to refer to another Russian act, being Abstract Spirit, one of my favorite Doom acts from the East of Europe for sure!). The tempo is even denser and heavier (read: slower) than the first composition. Who Dies In Siberian Slush might not be the best known act from Russia’s Doom-scene, but with this split they might reach new areas. They deserve it! But luckily we still have their numerous releases to hold on, including more than one hand full of full length studio records (on this site’s update of January 27th 2015 you will find the review undersigned did for the band’s latest full album, Hollow), and their contribution on this split. Once again it was created by frontman Sami Rautio (vocals and guitars, song writing and lyrics, mix and mastering) with Jürgen Frohling and Twist joining the crew once again on drums and basses respectively. As the intelligent ones amongst you already guessed, The Symmetry Of Grief is, once again, a splendid MFL-release, and two great acts on one release is an invitation for repleting your private collection.